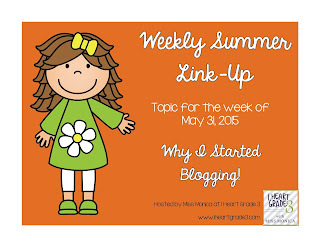 I'm linking up with Monica over at I Heart Grade 3 for her Weekly Summer Link-Up. This week's topic is Why I Started Blogging. When I was in Teacher's College, one of our course requirements was how to blog. We were assessed on our creativity, content, and color. We had to add visuals to our blogs. We had to make sure that our blogs were interactive. We had to have links that directed parents and students to other educational websites. We also had to comment on each other's blogs. I truly enjoyed that course! It was a hands-on and engaging course! However, once the course was over and done with, my blog was neglected and forgotten. Fast forward to the following summer. I was amazed by all their creativity. I was inspired by their talents. I was motivated by their teaching passion. Reading everyone's educational blogs inspired me to also be a part of this wonderful collaborative world. And, thanks to my course, I felt confident that I would be able to take an a new venture. Thus, my blog was born. Do you blog? What inspired you to blog? Wow! I love the idea that one of your course requirements was to blog! Man, I could have used a course back when I started! My first crack at blogging was with a WordPress free template, and then I *tried* to do one on my own. TOTAL DISASTER! I gave up and hired someone to do it for me. I know where my talents lie - and blog design is NOT one of them. lol! That's really cool that creating a blog was one of your course requirements. I agree this community is fabulous and a great one to be a part of! Thanks for sharing your story!